DM e-News - LOTS OF IT! The emerald ash-borer is a threat to trees in this part of Wisconsin. The article list starts on the next page. 12 - Need Assistance to Comment on Verona Road Project? · Am I eligible for a home? · What assistance can I receive in order to be prepared? Find out about the single family homes being built right in our neighborhood and a home readiness program that will prepare you. and accessibility modifications for low to moderate income homeowners in the City of Madison. To qualify you must own and live in your own home. The home must be located in the City of Madison and be assessed below $223,250. Your household income must be at or below 80% of the County Median Income level. Single household maximum Annual Gross Income is $44,800; for two people, the total maximum gross income $51,200. The cost is $10.00 per hour for labor plus the cost of materials. To apply for this program, please call Project Home at (608) 246-3737, ext. 2201 to speak to Regan Jacobsen. October is an exciting month for kids…It’s Halloween! They have candy and costumes on their minds. Please follow the safety tips so Halloween night is fun for all kids. Also kids, talk with a Fitchburg Police Officer and get a glow necklace. * Trick or treat between 5:00 P.M. and 8:00 P.M.
Department Immediately at (608) 270-4300. The Mayor’s Neighborhood Roundtable offers another opportunity for review, discussion and comment on the preliminary Economic Development Committee (EDC) options for City development review. Hear results of Neighborhood Summits I & II and build off of this input to encourage that the EDC report considers neighborhood concerns and interests. There will also be a chance to learn the basics of the City development review process and to learn about the zoning code rewrite project and how both apply to neighborhoods. MG&E and the Department of Planning & Community & Economic Development are sponsors and the event is free of charge. For more information and to register, go to http://www.cityofmadison.com/neighborhoods/ <http://www.cityofmadison.com/neighborhoods/> . ONLINE REGISTRATION IS OPEN UNTIL THURSDAY NOVEMBER 4 AT 8AM. YOU MAY ALSO REGISTER AT THE EVENT. For further questions, contact Linda Horvath at 267-1131 lhorvath@cityofmadison.com <mailto:lhorvath@cityofmadison.com <mailto:lhorvath@cityofmadison.com> > or Ruth Ethington at 267-8727, rethington@cityofmadison.com. The City of Madison Parks Division is hosting a public informational/listening sessions concerning Goose Management in public parks. Staff is gathering information in order to put forth a Goose Management Plan for the Madison Parks Commission’s consideration in late 2010. The session will focus on Geese in general parklands. November 16, 6:30p.m. – 8:00p.m. The State Bar will present an adult education program about the new OWI (Operating While Intoxicated) law from 6 until 8 pm on Wednesday, November 17 at the Boys and Girls Club. This presentation is free and open to the public. No registration is necessary. A panel of local legal professionals, local law enforcement, judges, and community advocates will present the facts about OWI. Check out the list of questions that will be addressed by clicking on the attachment. Elver, Warner and Olin Parks this October and November. Neighborhood voters who live in the Fitchburg part of the neighborhood normally vote at Fire Station #2 <http://www.city.fitchburg.wi.us/city_clerk/documents/Ald.Dist.1.pdf> , 5415 King James Way, Fitchburg WI 53719, so that’s where to go on Election Day to vote. Voters who live in Madison may still register and vote at the City Clerk’s office in the City County Building on Martin Luther King, Jr. Blvd. Registration is possible until 5:00 pm on Monday, November 1. Be sure to know your Wisconsin driver’s license number and to bring proof of residence. Neighborhood voters who live in the Madison part of the neighborhood vote on Election Day at the Head Start building on Red Arrow Trail near MacDonald’s. If you have never voted while living at your current address, you must register your new address. This is also necessary if you have changed your name. Then take it and your driver’s license and other required documentation to your city clerk now or to the polls on Election Day, Tuesday, November 2. (Madison clerk: City-County Bldg. at 210 Dr. Martin Luther King Blvd., Jr just off the Square. Fitchburg clerk: Fitchburg City Hall, 5520 Lacy Road.) If you procrastinate until Election Day, be sure to take all the necessary ID and proof of residence with you. · are valid on the day used to register to vote. Remember proof of residence must contain your current and complete first and last name, your current residential address, and must be valid on the day you register to vote or when you do vote at the polls. You can check where to vote by going to http://vpa.wi.gov/. On the page that comes up, choose “Look up polling place location for an address” and then put your address in. When the new screen comes up, I found that if I used a Madison mailing address for a neighborhood location in Fitchburg, I got message “Your search found no matches. Please try again or contact the elections office for more information.” That’s a clue that you live in Fitchburg. When I went back and used Fitchburg in the city blank, I got confirmation that the address was indeed in Fitchburg. From there, if you click on the street link, you can find out where to vote, find out who now represents you, and also see a sample ballot. 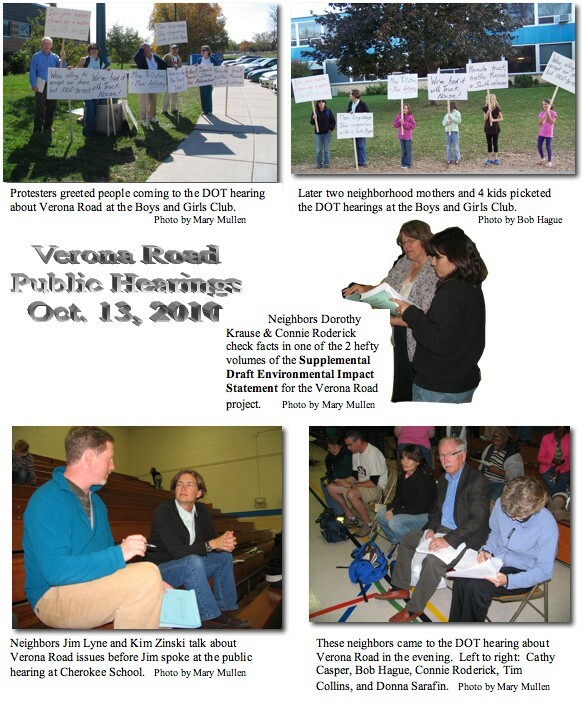 Don’t kick yourself because you didn’t get to the Verona Road environmental impact statement hearing last week, but DO kick yourself into gear to write your comments about the project to the Wisconsin Department of Transportation. The written comment period has been extended twice, and now the final date to get your comments in is Friday, December 17. Don’t procrastinate, though. It would be so easy to think there’s lots of time… and then all of a sudden it will be December 18 and too late. The Supplemental Draft Environmental Impact Statement on the project can be studied at any of the nearby public library branches, at the main library downtown, or right in our own neighborhood at Fauozi’s Restaurant on the Beltline Frontage Road. Don’t get discouraged because the document is huge – two 500-page volumes. Look first at the “Executive Summary” in the front of Volume I. Then you might want to study the table of contents to see how to delve further into the topics you are most interested in. If looking at the huge Verona Road document is not your cup of tea, but you still want some direction on issues you can comment on, the Dunn’s Marsh Neighborhood Association position paper might be just the thing for you. Both the letter to the mayor and the longer rationale for each position is available upon request. Send your request to Mary Mullen, Dunn’s Marsh Communications Chair. See the masthead for contact information. She also has custody of a large map that can help you see what’s planned. · stormwater management that meets Fitchburg’s Muncipal Code and doesn’t negatively affect properties either upstream or downstream of the highway improvements. What do all these ideas have in common? They are all suggestions that the City of Fitchburg has requested in a formal statement about the Verona Road project. The recommendations are included in Resolution R-95-10 “Endorsing Submittal of Comments for the Supplemental Draft Environmental Impact Statement for Verona Road Improvements.” To learn details, read the actual document. It is attached. While the suggestions about noise walls and the grade-separated crossings primarily pertain to Stage 2 which is about 7 years away, some relate to Stage 1 construction, planned for 2013. Another neighbor who has often testified at public hearings checked whether the court reporter might be a DOT employee. She was one person who was definitely listening so she could type what was being said. “No,’ the court reporter said, she was not an employee of the Department of Transportation. She was just the person hired for the job of putting the oral testimony into the public record. What’s all this fuss about? It’s about the structure of the official public hearings on the Verona Road Supplemental Draft Environmental Impact Statement. Normal public hearings are held in a quiet room where everyone present is expected to listen and does listen. In particular, the chair of the governmental entity holding the hearing is present at the front of the room, calls the registered speakers to the podium, and then actually looks at the speaker giving testimony. Usually a group of additional government representatives such as committee members are present and attentive to the speakers. At the two public hearings on this subject – one held at the Boys and Girls Club during the day and the other held at Cherokee School in the evening - this was definitely not the situation. Plenty of Department of Transportation staff and additional staff from the DOT’s consultant Strand Associates were present in the gyms. But the thing is, none of those we have come to recognize as the major players in this drama was seated at the officials’ table. Only a timer wore the blue shirt, and he was mainly watching the clock so he could stop the testimony at the 3-minute mark. It also wasn’t clear whether anyone in the audience might have been a DOT official. The obvious staff members, dressed in blue shirts, were either parked way across the room interpreting the many displays about the Verona Road project or hanging around together in groups in the middle of the room visiting mainly with each other. All they could see would have been the back of the speaker if they paid any attention at all. In the Cherokee School gym, the testimony of speakers sounded like background radio talk at a lively cocktail party. Before I inadvertently drifted over to the corner where testimony was being taken, I myself continued to wonder where the amplified sound was coming from. I finally realized that I was standing right behind Connie Roderick who was at the microphone delivering her testimony. It was her voice that I had been hearing all along. Even after I knew this, I could barely understand what she was saying. Her words were lost in the general chatter around the gym. Later when I myself spoke, I had to fight to actually hear my own testimony. It was difficult to feel that anyone was listening although a small audience of neighbors sat in the one row of chairs provided and a few other people lounged loosely on 2 or 3 benches of bleachers beyond the chairs. In the end, llke Connie, I felt that I had been completely disrespected. The hearing was mainly a little out-of-the-way sideshow for the people who had expected to be taken seriously but came to feel that they were obviously being snubbed. The real show was DOT’s disregard for a legal requirement they apparently preferred to ignore. Do you think that ALL the Strand and DOT employees in attendance will actually READ what the court reported typed, or will only a handful of those in charge read it. I am also wondering how the court reporter could even hear what was being said. She even stopped one of the speakers because she couldn't hear her. This was totally unacceptable for a Public Hearing. Also, the people coming to the meeting that were milling about the poster boards were not attentive because it wasn't "formal" and you didn’t even know what in the world was on the loud speaker. It was someone testifying. That's what I encountered as I walked in - something inaudible being said on a loudspeaker. Then I found out that's the testimony. How disrespectful and chaotic it was. Also, I've given statements before and the record of my statements in print read "inaudible.” So did the recorder really hear and type every word we testified? This hearing was outrageous to me. Sorry to go on and on but I think I'm more pissed at the employees personally than I ever was. In fact, I wasn't holding them personally accountable in the past, but I think this was over the line. One neat (cool, awesome, etc) feature of the Verona Road Supplemental Draft Environmental Impact Statement is the illustrations. Check out the attached air photo of our neighborhood in 1955 when only the Marlborough and part of the Crawford areas were built up and everything else was farmland. A photo of the same area in 2008 shows that only a small area west of Red Arrow Trail and north of Crescent Road was left to build on. Eight Council members were chosen by DMNA members attending the Dunn’s Marsh Neighborhood Association meeting on October 21. Three are totally new to the Council, while 5 were returning members. New Council member Bob Hague will join Jo Kelley and Gigi Miller Solari in representing the Crawford area of the neighborhood. Representing the Marlborough part of the neighborhood will be new member John Bach who joins Jeff Glazer, Donna Sarafin, and Mary Mullen. Dorothy Krause is the new Council member representing Belmar. Four more Council members may be chosen to represent residents, but that would be dependent on volunteers submitting applications to the Neighborhood Council. One of the positions must be reserved for a representative from the Allied area, but the other three could be from any part of the neighborhood. Retiring members of the Council are Solare O’Brien who was Secretary last year and President the year before, (maybe) Carol Poole who has served as Treasurer for many years but is fining that her overtime work and Fitchburg City Council activitiesleave little time for DMNA meetings, Nathan Franklin, and Peter Schmitt. On your recommendation of how to best handle fall leaves in order to keep "P" [Phosphorus] out of our lakes I would like to add that the suggested method can be a two-edged sword. Some leaves, e.g. American oak and black walnut - I have plenty of those in my garden - will prevent other plants from thriving even when mulched. As a matter of fact, when mulched, they are useful as weed preventer in an established flowerbed but very detrimental on your lawn, in a vegetable plot or a flower bed you are just trying to create. It is also a good idea to keep them out of the compost pile or bin in your back yard unless you have plenty of space and can afford to create separate piles for them in successive years. They digest very slowly and it takes several years before you can use them as compost. I bring those leaves from my back yard to the city yard waste lot on Badger Rd. Last June I visited my friends David and Linda Martin in Fitchburg, Wisconsin. I was for ten days in the States and we prepared for a hike in the Porcupine Mountains State Park in Michigan: the “Porkies” as David says. David and I are old friends. Before retiring, we worked both in meteorology, I in the Netherlands in Europe and he in Madison. David lives already for 41 years in Fitchburg. Before we went to the Porkies he took me out for a walk around his house. He did before during other times when I visited Madison, but this time we walked a bit more, for about two hours or so. That gave us the opportunity to see not only the lanes and streets of Fitchburg itself, but also Dunn’s Marsh and the groups of trees surrounding it. As I am a birdwatcher, I looked carefully around me during that walk and I saw many different species. So many that I like to write this down and share this experience with you. May be you can see Fitchburg and its surrounding a bit through my eyes, the eyes from a foreigner from Europe. Immediately when we left David’s house, at Sentinel Pass in the middle of Fitchburg, we saw Red winged Blackbirds. A beautiful bird with red stripes in its wings, you can see it sitting on the lanes and wires. Also Crows, Starlings, Common Grackles you can see on the grass around the houses or on the telephone wires. After a while, passing some bike paths and an old railway track, we came to a marsh. We saw Song Sparrows in the top of the bushes of the marsh, singing their songs, and the Eastern Phoebe and Gray Catbird. Suddenly we saw a small bright yellow bird. After looking it up in our field guide it was clear that it was Yellow Warbler. Close to the marsh is a lake. In the lake and at its shores we saw larger birds: the Great Blue Heron, the Mallard (a kind of duck), and the Great Egret, a beautiful large white heron that catches fish. David told me that during the migration periods of the birds, in April and October you can see all kinds of migrants, for instance the Whistling Swan. And during the fall all kinds of Ducks come in from the north, escaping the cold weather of Canada. After the marsh and the lake, we crossed the Seminole Highway and entered a relatively new part of Fitchburg. Here we saw Barn Swallows, but also some bright yellow and blue song birds. They appeared to be American Gold Finches and Bluebirds. Dusk set in and it was time to go back. I had seen old and new species, some of them beautifully colored and others with nice songs. On our way back we even got an extra: we saw a Red tailed Hawk. Very close by on the top of a tree, he was watching us. The walk came to an end. I was impressed in what a good surrounding David and Linda lived and promised myself to come back as much as possible. Fruits. And Nuts. Well we won. Thanks to a spirited last minute drive, Wingra Park swept into fifth place and was awarded 16 dwarf fruit trees in the Edy's contest. I was honored to attend the groundbreaking for the planting of the 16 trees which received conditional support from the Madison Parks Department. Thanks to the DMNA Parks Committee for their great work. I've been in several meetings to develop city policy that allows for expanding "edible landscapes" throughout the city. Fresh local free produce. Hmmm. Sounds like a win win. SW Bike Path. I created quite a storm a few weeks ago by suggesting on a local list serve that I think we should light the bike path. The storm only subsided after I reiterated that I wouldn't light the path in the dark of night with no one watching (ala Jim Irsay moving the Colts from Baltimore to Indianapolis at 2 am). Let the storm clouds gather: I still think we should light the path. I think we need to do it in a way that is both dark sky and dark living room compliant. I'm planning on having a community meeting on this in early spring; stay tuned. Badger Den Restaurant: Chris Berge has put this unique idea on hold for now. As you probably read in the paper, he's going to devote his energy into converting Restaurant Magnus into a bike friendly eatery called Velo Bahn. If it looks like he's going to move forward on the SW Bike Path proposal at some point in the future, I'll let you know. Allied Phase II: We are getting closer every day on phase two of the redevelopment project in Allied (remember, phase one was rental, phase two is home ownership). While phase one was far from perfect, it created some beautiful housing in Allied (and a great public art project! ), some jobs for Allied residents, and leased up very quickly, with approximately 50% of the tenants coming from within the neighborhood, and 50% from outside (a mix I was very pleased with). Phase two is proving to be more difficult. I’ve met with the CDA and asked them for a housing plan by the end of the month. I’ve asked that it include information about affordability, home ownership readiness / credit repair, how to prioritize Allied residents for housing, and how to create jobs for Allied area residents. Other outstanding community issues include the name of the development, what to do with the common space / public areas, and how to run the development (think condo association) in a way that is integrated with the broader community as opposed to separate from it. This remains a very exciting project for the Allied community. · Fall Leaf Collection: Starts on October 4th. For more information, check out: http://www.cityofmadison.com/streets/collectionLeaf.cfm <http://www.cityofmadison.com/streets/collectionLeaf.cfm> . Fall Hayrides. Each hayride trip is one hour: 30 minute ride, 30 minute campfire and ‘smores. The wagon, pulled by a tractor, will take your group on a scenic tour of the park. Please note that participants will need to enter/exit the wagon using a step ladder. Check out the following for more information: http://www.cityofmadison.com/parks/hayrides.html <http://www.cityofmadison.com/parks/hayrides.html> or call Madison Parks at (608) 266-4711. The cost is $80.00 + tax per group (1-24 people). One hour Hayride Trip includes 30 minute wagon ride, 30 minute campfire. Advance registration required. 2010 Emerald Ash Borer (EAB) Public Meetings: Madison Parks is hosting public meetings on the number of possible options available to combat Emerald Ash Borer. City staff will outline the role of City Forestry, a short history of EAB, the role of the EAB task force, and options and their associated costs available to communities to combat EAB. To learn more, visit http://emeraldashborer.wi.gov/ <http://emeraldashborer.wi.gov/> . Mayor’s Neighborhood Roundtable: November 6, 8am-12:30pm, Urban League of Greater Madison, 2222 South Park Street. Hear Mayor Dave’s opening address and build your knowledge and skills concerning the City’s development review process. Networking with neighbors and sharing success stories will also be a part of this event. MG&E and the Department of Planning & Community & Economic Development is sponsoring the Roundtable and registration is free. A workshop schedule and registration information will be available at www.cityofmadison.com/neighborhoods/ starting in early October. You may also contact Linda Horvath at 267-1131 or lhorvath@cityofmadison.com. Las Casitas: This is a low income condo development in the Allied Drive area that faced foreclosure. A number of owners (mostly limited English proficient Latinos) have felt robbed and discriminated against by the developer. We’ve had several meetings on this issue and things are moving forward. Habitat for Humanity has purchased six units and Housing Initiatives has purchased five. These are great organizations who are already working to re-form the condo association and help owners take back control of the development. Some folks are having financing problems as well so several organizations are involved to assist with that aspect. Things are really progressing but we have a long way to go. · Thanks to everyone who came out to enjoy another amazing Monroe Street festival. 33rd annual, wow! Check out pictures at: http://www.monroestreetfestival.com/ <http://www.monroestreetfestival.com/> , thanks to all the sponsors, and please remember to keep supporting our local district 10 merchants! · Because Monroe Street loves nothing more than a party, the merchants are already planning another party, even with planners still sleeping off the festival that just ended. In November, the merchants will host the first annual Girls Night on Monroe Street to raise funds to buy a new (used) piano for the Monroe Street Fine Arts Center. The event will be held on Thursday evening, November 11 and will feature swag bags, dining and drink specials, and special offers in the participating shops. Tickets will be $15, and will go on sale at Orange Tree Imports on October 7. · The Monroe Street Merchants Association recently launched a new Facebook page for consumers, Shop Monroe Street - Madison. The plan is for the previous page (Monroe Street Merchants Association) to be reserved for member news. I hope all neighborhood residents will consider "liking" the new Shop Monroe Street page to keep up with all the news on the street. Clean Streets/Clean Lakes Program: I am planning on sponsoring an ordinance change to add District 10 to the districts participating in the Clean Streets/Clean Lakes program. The Clean Streets/Clean Lakes program will prohibit parking on Thursdays mornings (garbage collection day) so plows and sweepers can access both sides of the block once a week. It is especially helpful in avoiding the snow accumulation on street blocks with no alternate side parking restriction. If you are interested in helping with a petition to implement this program on your block, please let me know! Fall Elections: We have a pretty important one coming up. Don’t forget to vote on November 2nd. For more information about elections, check out http://www.cityofmadison.com/election/ <http://www.cityofmadison.com/election/> . Union Corners Purchase: The city made the bold decision two weeks ago to purchase the Union Corners development on East Washington Ave, using land banking funds. I definitely support this idea so we can take this area and achieve the potential of a prime infill development as opposed to piecemeal developments that would almost certainly have decreased the potential. For more information, check out the press release at: http://www.cityofmadison.com/news/view.cfm?news_id=2229 <http://www.cityofmadison.com/news/view.cfm?news_id=2229> . Overture. Most of you know by now that the ad-hoc committee voted 6-3 in support of the current proposal to have the city purchase Overture for $1 and have a non-profit run the center. The plan would eliminate the $28 million in debt and, conceptually set Overture on a path to recovery. As usual, I like some parts of this proposal but have a number of concerns. The two biggest are (1) the incredibly fast timeline for decisionmaking (hey, my LaFollette Institute of Public Affairs graduate work taught me at least one thing: gun-to-head decision-making never results in good policy) and (2) that most Madisonians just seem uninterested (there is a fine-line distinction between golden palace and crown jewel). Overture is the latter, but perception is reality and too many people, especially in this economy, see it as the former. Luckily we can just focus on Overture and not worry about anything else. Oh wait, it’s budget time too. Dang. Budget. Yes, our favorite time of year is upon us- culminating with three all nighters in a row in mid November with my fellow alders. I think the Mayor has announced a pretty good budget with a good mix between services and spending restraint. I’ll likely have some budget amendments but probably nothing as big as the last few years (think my opposition to bus fare increases and the unprecedented expansion of the police budget). As always and perhaps more than ever, I believe we need to continue to invest in our less fortunate neighbors, for I remain convinced those investments are not only the right thing to do, but also pay for themselves many fold in the long run. For more information on the budget, including a message from the Mayor, check out http://www.cityofmadison.com/comptroller/budget/2011/ <http://www.cityofmadison.com/comptroller/budget/2011/> . Re-election. People say being alder is a thankless job. That’s often true. But sometimes its not. Sometimes the joy that comes with standing up for your principles, doing something meaningful, or making a positive change in the community makes everything worth it. I mean that IS why I’m here, right? Most of you know that I have a very busy day job and two wonderful children. Most of you also know (or can at least imagine) that I don’t have as much time as I’d like for writing, reading, playing sports, or just playing. I also don’t have the time to do the job I’d like to do as your alder. So running for re-election next spring was far from a foregone conclusion. But after much thought and consideration, I have decided to run for re-election. Thanks as always for being engaged, being interested, and doing your part, however small, to give voice to the helpless, equality to the oppressed, and to help make our world a better place. It’s why I ran the first time and why I’m running again- thankless or not. I hope I’ll have your support again in April, 2011. Thanks for reading and for caring for our neighborhood. 6:30 – Social & sign-in – Free bowl of prize-winning chili for all you early birds plus sweet snacks while signing in, reading last year’s minutes, etc. Allied Wellness Co-op – Come and learn what it’s all about. Big Brothers-Big Sisters – Learn about the “School Friends” program. Committee Reports - Brief summaries – 2 minutes each!!!! EVERY RESIDENT IS WELCOME TO ATTEND AND TALK. Only members may vote. Join by filling out a form at the mtg. All residents of the Dunn’s Marsh Neighborhood are invited to attend the neighborhood social and Dunn’s Marsh Neighborhood Association annual meeting, this Thursday, 7 pm, at Prairie UU Society, 2010 Whenona Drive, on the corner of Whenona & Crawford Drives, a few short blocks south of the pedestrian/bike bridge over the Beltline. How do you know if you live within the DMNA boundaries? It’s easy. Just look at the attached map which also shows the 4 subareas from which Council representatives are shown. In short the Dunn’s Marsh Neighborhood’s boundaries are Verona Road, the Beltline, Seminole Highway, Dunn’s Marsh itself (below Crescent Road), and the Allied Drive/Carling Drive areas. If you live within this area, we welcome you to attend the social and the meeting. If you agree with our purposes – which are to unite neighbors to solve mutual problems and to promote fellowship among neighbors – you may also become a member for voting purposes. But regardless of whether you are a member, you are invited to come to eat, to learn, and to put in your 2 cents worth about how we can work together to make our neighborhood an even better place to be. The evening starts at 6:30 pm with a bowl of chili and some sweet treats. Jeff Glazer, whose chili won the highest ranking at the chili fest, will try to recreate his prize-winning chili. It should warm us up for the meeting itself. We hope people will sign in during this time and check out last year’s minutes. The meeting starts at 7 pm sharp with brief presentations from other organizations active in our neighborhood. 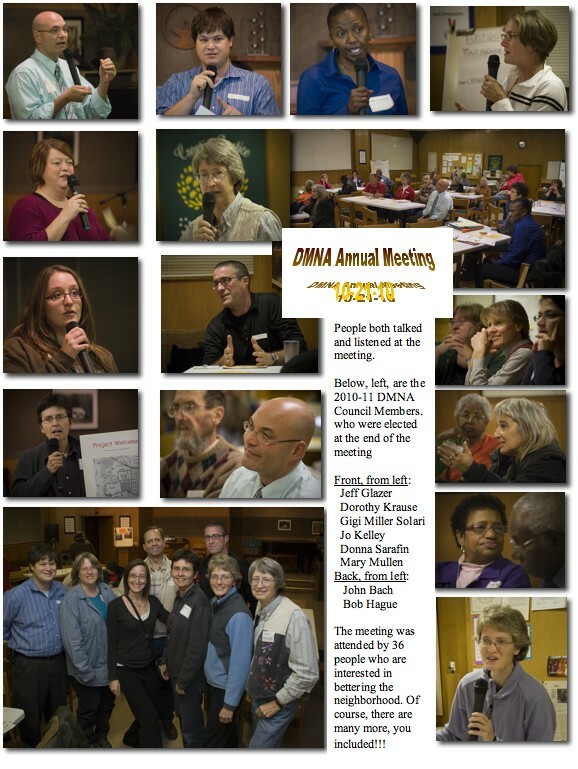 Next, DMNA Council members will give short reports on their activities during the past year. We’ve been a busy bunch! Then it’s time for you to talk. After that “caucuses” from each of the 4 neighborhood areas may choose their representatives for next year’s DMNA Council. Please come, and bring as many interested friends as you can. This notice comes from Mary Mullen, Communications Chair, Dunn’s Marsh Neighborhood Association. Just as a bonus, I’ve attached a couple of small maps of the project: Verona Stage 1 map.doc. As a reminder, here’s a repeat the information about the time and place of the hearings and where to e-mail or send written comments. 6:00 PM – 9:00 PM at Cherokee Middle School Gym, 4301 Cherokee Dr.
From Mary Mullen, Dunn’s Marsh Neighborhood Association Communications, 608-298-0843. Over the past many months we’ve tried to keep you abreast of informational meetings about the planned reconstruction of Verona Road and the West Beltline. Our Dunn’s Marsh Neighborhood will be hit with a double whammy because these highways form 2 of the 5 boundaries of the neighborhood. The highways are either visible or audible (noisy) almost everywhere in the neighborhood, and because of heavy traffic that prompted past improvements, there is only one route across each one from the neighborhood. Now is the final and official chance to express opinions about the project. The full project is described – along with its effects – in the Supplemental Draft Environmental Impact Statement (SDEIS) for the project. The SDEIS can be found online at http://www.dot.wisconsin.gov/projects/d1/verona/environment.htm#sdeis [Copy and paste the preceding link into your browser window.] Look at a hardcopy at many locations including nearby library branches and at Faouzi’s Restaurant at 4245 West Beltline Frontage Road in the neighborhood. This hefty 2-volume document is daunting, but if you are pressed for time, try the Executive Summary which is on pages ES-1 to ES-20 in the front of the first volume. Everyone and anyone is invited to attend and speak at the public hearing or to submit written comments. Don’t pass up this opportunity. The squeaky wheel gets the grease. Feeling shy? Come anyway. You will be in good company, and friends from the neighborhood will be there to help you sign up to speak and can even accompany you to the microphone if you wish. Need a ride? Reply to this e-mail or call 271-5192, and the Dunn’s Marsh Neighborhood Association will see to it that you get one. “The planned changes will profoundly affect the Dunn’s Marsh Neighborhood,” said JoAnne Kelley, a neighbor who lives on Crawford Drive who has been active in learning about it and arranging ways to inform the neighborhood. On October 7, Dunn’s Marsh Neighborhood Association President Jeff Glazer and the Allied-Dunn’s Marsh Neighborhood Association President sent a letter and position paper to Madison’s Mayor Dave listing 16 comments and requests made by the 2 neighborhood associations. It is attached. The detailed rationale for each position item is available as a document by replying to this notice and asking for it. The DOT plans include the changes listed below. making a so-called jug-handle circular route to allow our neighborhood drivers to cross under Verona Road and get onto Verona Road heading south. Traffic from our neighborhood going north to Beltline or Midvale will just turn right onto Verona Road as it does now. creating a new holding pond for stormwater in the woods on the west side of Dunn’s Marsh. Remember, the squeaky wheel gets the grease.